Samsung appears to have one more wearable gadget up its sleeve for 2014 in the form of the long-overdue S Band activity tracker. The display-less S Band was originally announced during last year's literal song and dance routine in which Samsung unveiled the Galaxy S4, but it never launched. Now, exactly one year to the day later, with the Galaxy S5 around the corner, we're seeing what appears to be a sales guide for a redesigned fitness tracker courtesy of SamMobile. 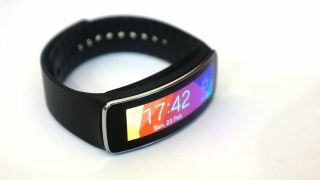 The S Band is said to monitor calories burned, steps, distance and sleep efficiency, all metrics that can be transferred from the sensor to a phone - presumably only Galaxy devices with S Health 3.0. Incoming calls and text notifications vibrate this wrist-worn wearable and flash its tiny LED. A loss protection mode is supposed to do the same when the Bluetooth-connected device is out of range. There's nothing to confirm that Samsung is preparing to resurrect the S Band that it has put off for a year like our poor gym habits. Today's marketing slides actually look a little dated considering there's a Galaxy S4 pictured in the material and the grammar appears to be off in several cases. Its claim that "this will prevent you from lost your phone or child in the crowd" doesn't exactly strike consumer confidence. This sales pitch clearly isn't ready for prime time. Samsung also has plenty of other forthcoming wearables, including the Gear 2, Gear 2 Neo and stylish Gear Fit. If the S Band does finally come out, expect it to be on the lower end of a price spectrum.